Túath is the old Irish for people, tribe or nation as in Tuatha Dé Danann (“People of the godess Danu”, a supernatural race in Irish mythology). 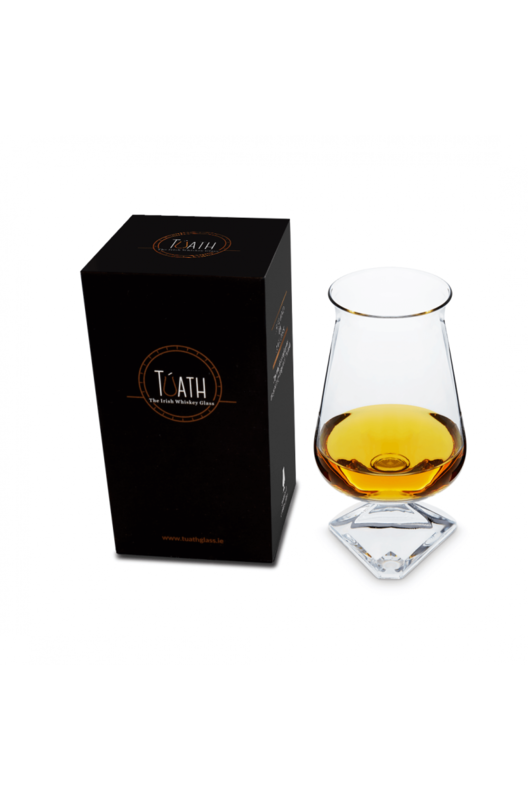 The Túath glass was created specifically for the enjoyment of Irish whiskey, a lot of thought, care and time has gone in to creating the Túath glass. The Túath glass is larger, taller and has a wider opening than the norm. This offers the advantage of the whiskey having a greater area to swirl around in which give the aromas a better chance of being released. This is where the Túath really comes into its own. The base is specially designed to be held between the thumb, forefinger and middle finger with the first two digits on the top and the middle finger resting under the base. The pyramid-like angles of the stem where inspired by the island of Skellig Michael. This glass is a pure joy to nose whiskey with. The flared rim tends to help soften the hot alcohol notes. This combined with the taller glass bowl reduces the chances of any burning sensations but really brings out fruit and ester aromas. The most important part! This is where the flared rim reveals its other advantage by delivering the liquid straight onto the centre of the tongue. This means that you get the full taste of the whiskey and it is distributed evenly to all the areas of the tongue. A surprising bonus to this was that unlike other tasting glasses there is no need to tip your head back for a sip. The new Túath Whiskey Glass Gold Rim and box is now available at Celtic Whiskey Shop. T&..